FC Barcelona is many a sportive leftist’s major European football side of choice, thanks to the club’s longtime identification with its city’s Catalan anti-Francoism. That identification, stretching all the way back to the club’s formative early-20th century years (“History of FC Barcelona” enjoys its own voluminous Wikipedia page) put the Barca president at the end of fascist guns on this date in 1936. Josep Sunyol was born into the Catalan elite, and had a varied career in the public eye: left activist, parliamentary deputy, newspaper founder, and, come 1935, president of FC Barcelona. He’d been serving on the Barca board of directors since 1928. There’s a lengthy Sunyol biography here. It was in his political, rather than his footballing, capacity that in August 1936 — just days into the Spanish Civil War — Sunyol traveled from Barcelona to Madrid to meet with fellow Republicans. 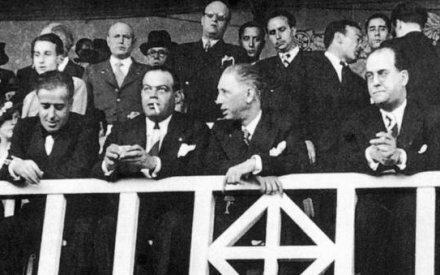 Whatever Sunyol’s intention, he was quickly recognized and detained by his foes on the evening of August 6. Shortly thereafter, they decided to shoot him out of hand. The civil war and the era of Franco are still sensitive topic in Spain, but FC Barcelona’s politically engaged supporters have pushed the present-day club (with partial success) to more overtly embrace its anti-fascist “martyr president”.